Special thanks to Harp for the first seven photos below and SegerHicks for the last photo! Thanks again Harp and Seger! Wow, you guys are fast….I’ve got some of these myself to send over….hard to believe this was less than a day ago and I was there….so awesome….he looks better than ever, if thats even possible…. Harp, you know I always love your photos! Thanks, SegerHicks, Harp and TaysH. I hope you had a wonderful night! Oh, and I love your new header! Very, very nice! Wow! These are awesome shots! Front and back shots of Taylor are equally gorgeous! He looks very natural, relaxed and happy. Thanks so much Harp and Seger! Thank you so much, Harp, Seger & TH for sharing these wonderful pictures with us all. Thanks for the photos Harp, Seger and TH. He looks a little tired, hot and flushed and yet he was back to do 2 more Grease shows today. 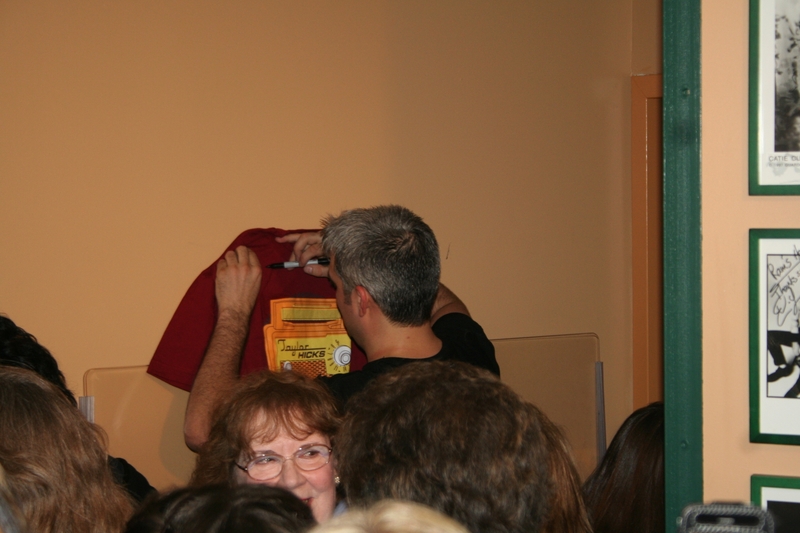 Was his t shirt inside out – photo #1? The man is amazing….of course he’s young and doesn’t have a family to drag around (just Bill) but he’s consistently gracious to his fans. And you, TH are the same to us. We wait with baited breath for every posting. ‘Preciate it. Wow! Very, very nice photos! Kudos to all! He looks fantastic! So nice to see new shots of him! He looks well and happy! Thanks so much! Thnaks for sharing these great pics! Wow, I think this might be the shortest I’ve seen his hair. I love the long sideburns though. 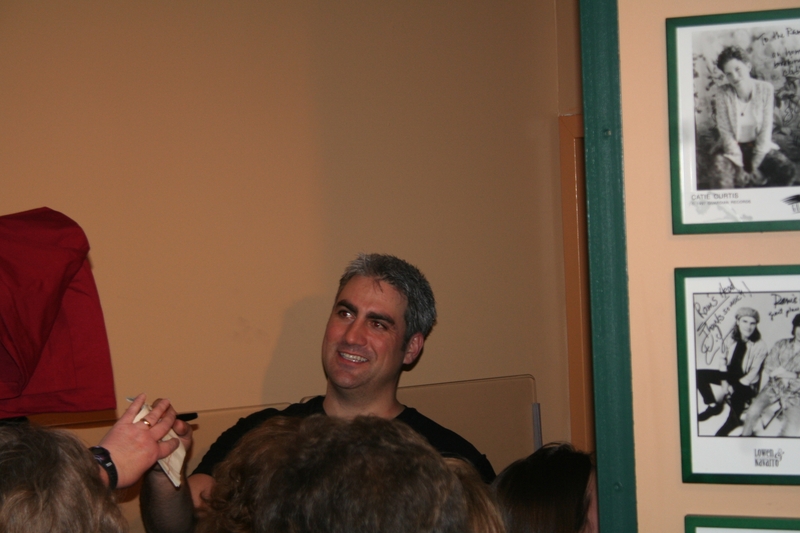 Now, does he not look just so happy to be back performing and greeting his fans? 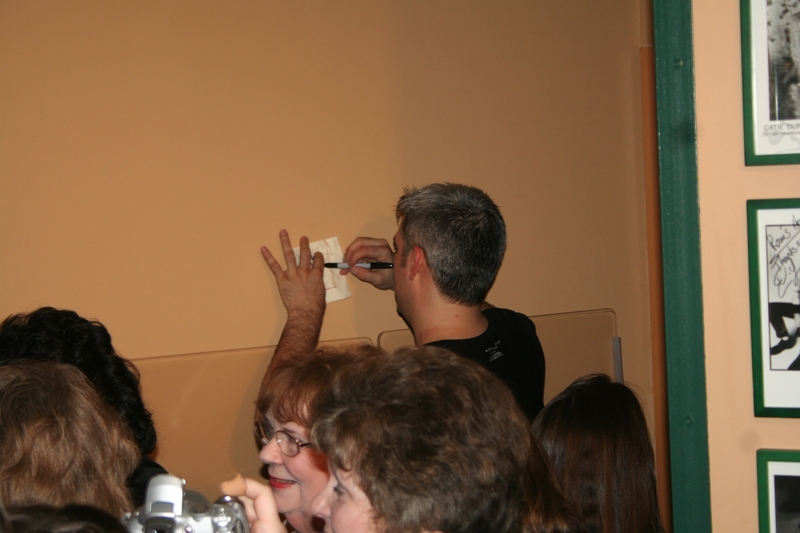 These are great shots- me, I would put a frame around that Sharpie mark- “Here is where Taylor Hicks messed up our wall”….. Have a great day, everyone!! GREAT PICS!!!!! Im so glad you all had a great time!!!! awwwwww Great pictures. Thanks for sharing. And Pearl Pattie, waiting for yours. You all are great. Great to see you again Harp…..Great pics! Thanks Seger for the great photo…sorry I didn’t have a chance to say hi….Taylor took it to a new level Saturday night…..it was beyond amazing! Thanks to Seger and Harp and, of course, TaysH. These are great pics. I am so jealous that you got to see him, but I’m glad that everyone had a great time! these pics are pure joy to see – thanks all! I was at the Grease show Fri night…a few people did start to leave the theater before it was announced that Taylor would sing…I told the people around me not to leave, that the best was yet to come. 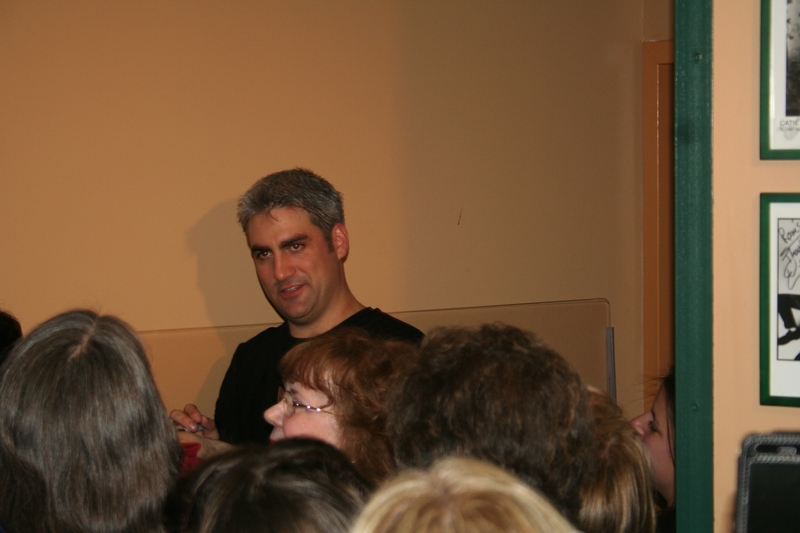 They sat back down….alot of them thanked me saying it was great….he did an awesome job with WRIR….it’s a great song. Of course I told everyone that the single is out and the cd drops on March 10th…He got a great response from the audience after….they played The Runaround when everyone left the theater….very cool…. GAH! Stunning pics ladies!!! Thanks for sharing. Love the great candid shots of Taylor. Thanks Harp, SegerHicks and TH for bringing them to us. 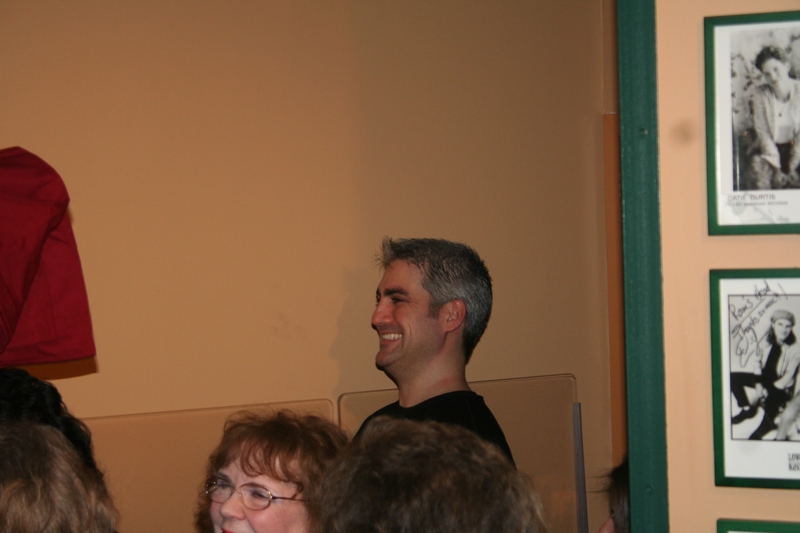 Yes, I agree….if I were standing that close, I’d have eyes only for him! He looks very happy in these pics!! He’s back in the thick of things!! Yes, Rosie his shirt’s inside out. Quick change or just ‘recycling’ a t-shirt from another wearing. ha. Man, it looked sweaty in that room. haahhaha Rosie, I noticed the same thing about his shirt. LOVE the pics! He’s always so good to his fans… It sounds like it was a wonderful night! and #8 – hair horn and tongue! are my favs. The venue was hot way before Taylor took the stage. The tavern side was packed and HOT and the concert area needed some AC. Taylor toweled off many times during the show and he must have nearly died in that jacket considering all the moving he did! 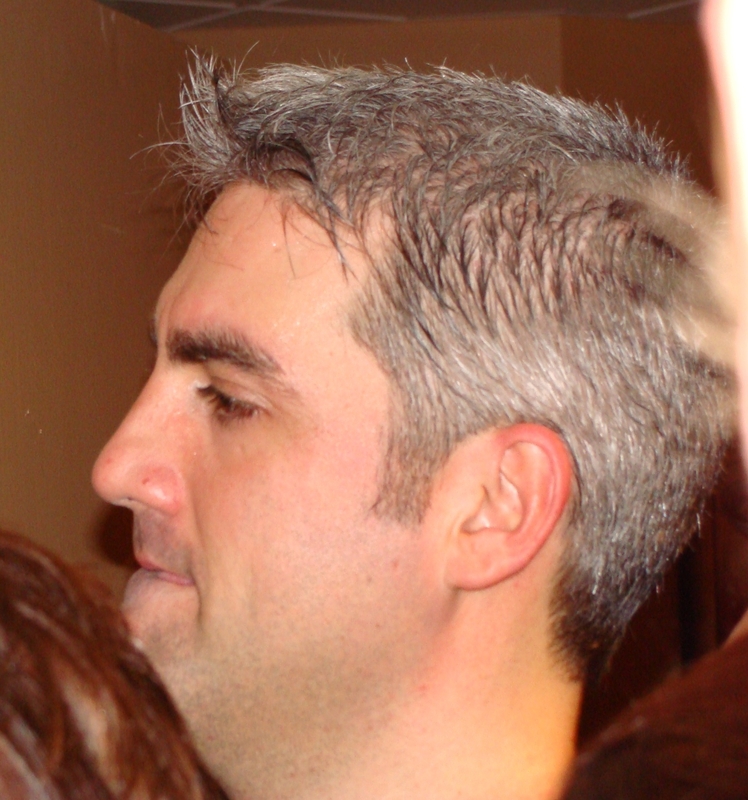 After it was over and he came out to sign stuff he still had beads if sweat above his upper lip. 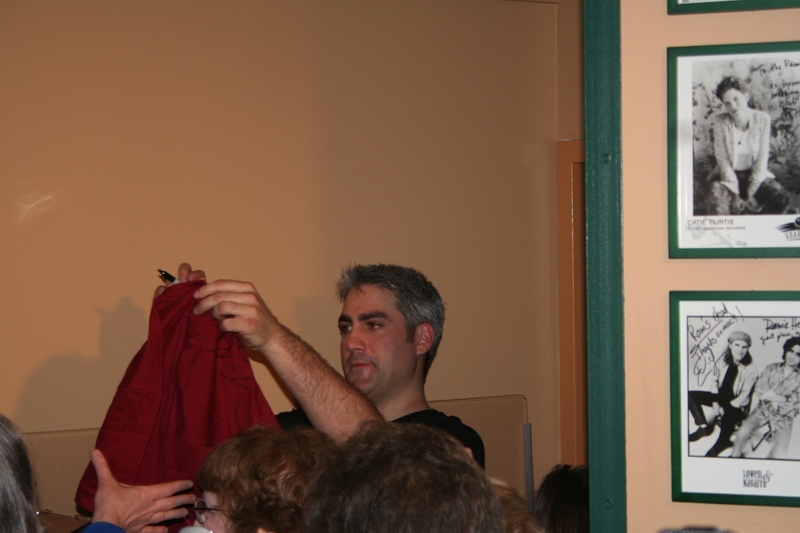 He must have been exhausted despite the thrill of performing for a loving crowd and he was so gracious to sign tons of items. This is going to be an AWESOME CD! The new tunes are phenominal, the man has good taste. His shirt was inside out. Thanks everyone! That tiny corner was really crowded, and I had to stand on a chair, to get these shots. The sharpie mark on the wall was pretty funny. Bwhahaha! Harp, I can just imagine. Making me sweat just looking at ’em. Wow! Don’t forget (as I sometimes do) to go to the large size version of these pictures. Great photos, Harp and SegerHicks…they really capture his energy and enthusiasm that night…and the Sharpie mark on the wall is hilarious. Thanks to Harp, SH and TaysH for all of these! 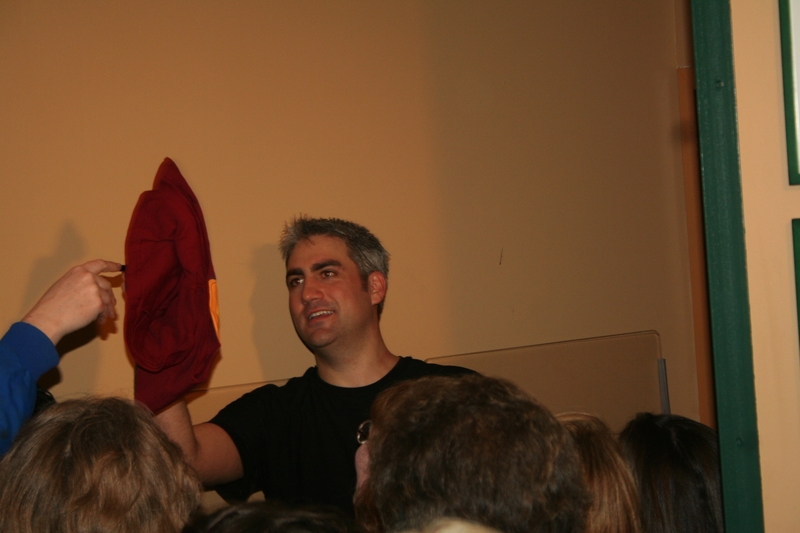 I had not seen the Taylor Hicks on the radio shirt before…. GREAT photos of him mixing with his adoring fans. #3 and #4 have my attention today. Thanks Harp & Seeger great shots … he sure was crowded in that corner, but like the trooper he is smiled and made sure he accommodated everyone. Thanks for the peek at Ramshead, he’s so cute ! And that he takes a size M at Banana Republic…..LOL…..
Nice pictures. He looks happy. Wish I could have been there. Beautiful pictures…….. when does this man sleep???? #8, oh my, Taylor has the most beautiful eyes.